Team Liquid's new roster finished off its first week of play with a surprisingly hard-fought victory over OpTic Gaming to begin Week 1, Day 2 of the North American League of Legends Championship Series Spring Split in Los Angeles. Right from the get-go, it was clear that Team Liquid was looking for a repeat of its previous success against Team SoloMid. Forgoing the late-game staples of the current metagame, Liquid instead drafted the lane bullies of Kalista for AD carry Yiliang "Doublelift" Peng and Gnar for top laner Jun "Impact" Eon-yeong, as well as the early roaming presence of Malzahar for mid laner Eugene "Pobelter" Park. If Liquid's plan was to snowball the game from an early stage, though, then it certainly failed at that. Liquid's early objective control was on point, nabbing the first dragon and first turret, but the early kills went mostly to OpTic, including a first blood onto TL jungler Jake "Xmithie" Puchero on Sejuani as he picked up an Ocean Drake. Shortly after, some costly mid-game mistakes put OpTic's superior scaling composition in a solid position. However, everything fell apart for OpTic at once, as overly aggressive positioning combined with a lack of vision resulted in a 4-on-5 fight, giving three kills and a Baron to Team Liquid at 29 minutes, which it rode to a simple 36-minute victory after one more teamfight. Sloppiness was the story of this game from both sides, as Liquid failed to accrue a sufficient early lead, and OpTic threw away all of its good work in a mistake that, for a team of five LCS veterans, was completely unacceptable. Fan favorite organization Team SoloMid continued its struggles into Sunday, taking an upset loss to FlyQuest on Week 1, Day 2 of the North American League of Legends Championship Series Spring Split. Even after TSM's brutal loss to Team Liquid on Saturday, this comes as a shock. FlyQuest not only was regarded as one of the weaker rosters in the NA LCS entering the split, but also had to play substitute mid laner Jang "Keane" Lae-young. However, Keane rose to the occasion, first-picking Azir into Soren "Bjergsen" Bjerg fearlessly, acquiring a CS advantage and pulling off some fantastic Emperor's Divides throughout the game. TSM went with a late-game composition, with Xerath for Bjergsen and Kog'Maw for AD carry Jesper "Zven" Svenningsen. It's surprising, then, that TSM didn't fall apart until the teamfight phase. The collapse started innocuously, with FlyQuest winning a 2-for-0 fight near the 21-minute mark by the skin of its teeth, but it only got worse from there. Jungler Andy "AnDa" Hoang on Zac and top laner Lee "Flame" Ho-jong on Gnar simply had too easy of a time getting onto Zven's Kog'Maw, and TSM was seemingly never in position for a proper teamfight, giving objective after objective to FlyQuest. The one shining light for TSM was Bjergsen. 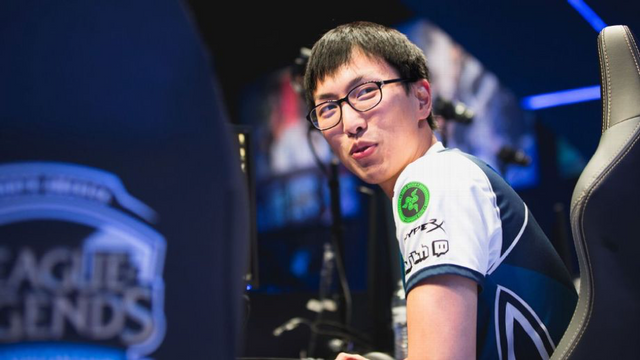 He chased off FlyQuest from his base almost single-handedly on multiple occasions, in one instance killing off FlyQuest AD carry Jason "WildTurtle" Tran's Kalista with five consecutive hits of the notoriously difficult Xerath ultimate. Bjergsen deserves a ton of credit for taking the game to 50 minutes and came away with perfect kill participation and zero deaths despite the loss. For TSM as a whole, however, this game is alarming, as the defending North American champs have started the split 0-2. 100 Thieves took down Counter Logic Gaming in a slow, controlled game near the end of Week 1, Day 2 of the NA LCS Spring Split. It was all 100 Thieves in the beginning, as the new LCS franchise never relinquished its early lead. Strong vision and smart positioning paved the way for 100 Thieves to find kills and objectives without any consequences. Counter Logic Gaming struggled throughout the early and mid game, illustrated by CLG getting its first kill 24 minutes into the game. 100 Thieves looked calm and collected as it stacked its gold lead through the mid game. The first true teamfight of the game didn't take place until the 29-minute mark, when 100 Thieves won a clean and decisive battle 4-for-0 to take Baron and close out the game. Despite giving up Zoe in the draft phase, Cloud9 took down Golden Guardians in the penultimate matchup of Week 1 of NA LCS in Los Angeles. Cloud9 targeted its first three bans toward Golden Guardians rookie AD carry Matthew "Deftly" Chen, but the Guardians simply sidestepped the issue and picked up the powerful Zoe for mid laner Hai "Hai" Du Lam. While the early game saw passive play from both sides, once Hai found first blood 11 minutes in, it was off to the races. Cloud9 took a proactive role in the race, which allowed the team to quickly find objectives and kills without much resistance. After winning an extended teamfight around Baron late in the game, C9 methodically sieged the Guardians base to close out the game. In the highly-touted matchup against his former team, Guardians jungler Juan "Contractz" Garcia didn't do much on his Jarvan IV, posting a 0/2/7 KDA (kills/deaths/assists). C9 rookie top laner Eric "Licorice" Ritchie, meanwhile, seemed unfazed by his subpar performance Saturday against Counter Logic Gaming and posted a 7/0/6 KDA as Kled. While C9 was seen as the clear favorite and still picked up the win, the Guardians showed plenty of potential by giving C9 a hard time. Echo Fox concluded a perfect Week 1 in NA LCS by claiming victory over Clutch Gaming in a one-sided slugfest on Sunday in Los Angeles. Echo Fox stormed into the game with two quick kills and mounted a sizable gold lead out the gate. Though the team didn't tally a large number of kills early, mid laner Kim "Fenix" Jae-hun single-handedly out-pressured Clutch Gaming mid laner Fabian "Febiven" Diepstraten and bought the rest of his team space to control the map. With a tempo advantage and absolute control, Echo Fox prioritized its macro play and ushered the enemy team away from its objectives. On the side of Clutch Gaming, the only redeeming factor in the game was the performance of AD carry Apollo "Apollo" Price on Tristana. He picked up half of his team's kills and remained deathless until the final moments of the game.